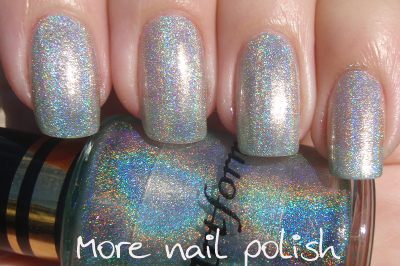 Continuing with my holo theme, here is the next Artform holo that you could win in my giveaway. Artform Aqua Blue - or light green to me. This one is super sheer. This was three coats. 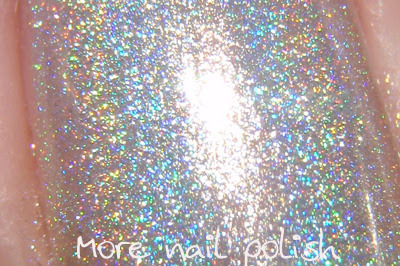 But it would also be great for layering over any polish to make it holo. I wanted to do a quick comparison to the Nfu Oh light green to see how it compares. Clearly they are different animals, although the colour similaralities were there. From what I have seen of swatches of the Glitter Gal green holo, this one looks very close, even down to it being so sheer. What I love about these polishes is that you don't have to wear them as a holo sandwich to get good wear, the application is heaps easier than Nfu Oh (as in you don't get strange bald spots) and they dry to a nice shiny finish. 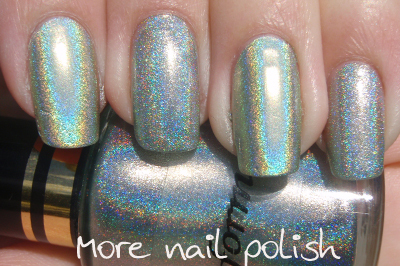 Both those holos are breathtaking! I love how it doesn't look too green.